Alaska Native News May 28, 2018. The Canadian government and Alberta are concerned that the Kinder Morgan pipeline expansion will be halted by British Columbia who has concerns of an oil spill on land or at sea in their territory if the expansion goes through. Kinder Morgan Canada Ltd, the Canadian arm of the Houston, Texas oil company has set a May 31st deadline threatening to scrap the expansion project slated to send crude from Alberta’s oil sands to the Vancouver, British Columbia port area for shipment overseas. The continued opposition has thus far thwarted Justin Trudeau’s energy policy, but he has assured all interested parties that the expansion will go through one way or the other. But, the federal government is convinced that any assurances given to the oil company will face rejection. If Kinder Morgan pulls the plug on the $5.5 billion Trans-Mountain pipeline, it will go the way of the Northern Gateway and the Energy East pipelines making it the third pipeline project to disappear since Canada’s liberal government took power in 2015. This will leave only the Keystone XL pipeline given new life by the Trump administration last year. The lack of transport capabilities already has affected Canada’s heavy crude prices which have been trading at heavy discounts. Much to the chagrin of the Alberta government, the British Columbian government announced an 18-month environmental impact study delaying the beginning of construction and driving up construction costs. 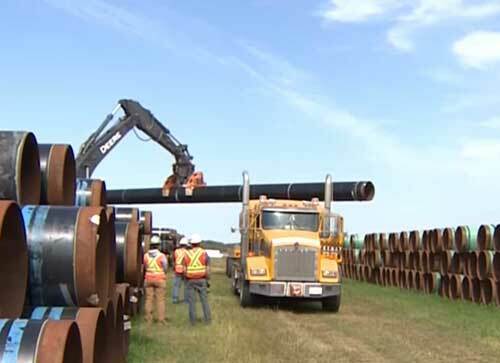 Alberta had hoped that the Trans-Mountain pipeline would ensure that flow from Alberta’s lucrative oil sands would continue uninterrupted. While work is in progress drawing up a bill making it mandatory for British Columbia to agree to any federal decision, the parliament has only one week left in session before it adjourns for the summer, making that a very slim possibility. Protesters have blocked access to Kinder Morgans site on a near-daily basis. Kinder Morgan has spent over $900 million thus far on regulations and advanced buying of equipment for the project. KML shares have dropped 9.7 percent since April.